You have a great website, but there’s always room for improvement right? Are there any clunky areas that are easily fixable? The days of “my son in law can build us a website” are thankfully long gone and we all recognise the importance of specialist expertise. But even the professionals have been known to make errors of judgment or let style triumph over usability. 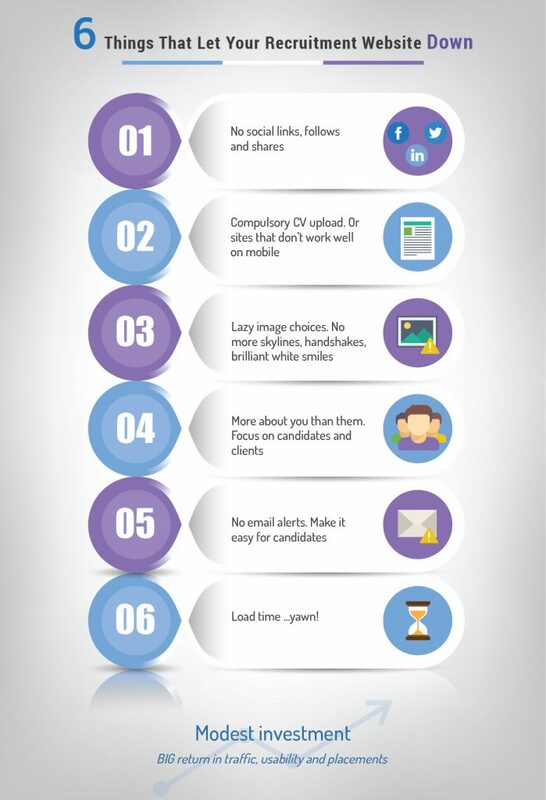 Recruitment can be a fickle business and trust is harder to gain than it is to lose. Your website is absolutely key to your reputation – we all overwhelmingly start our job searches digitally these days. 1. No social links, follows and shares. Can your web visitors easily share your jobs with their own social network? Can they tweet, share on Facebook, send links via email? It’s a secondary stream of traffic you may be completely ignoring. 2. Compulsory CV upload. Or sites that don’t work well on mobile. Does your site recognise that your user is on a mobile and become more forgiving of compulsory CV upload? Or better yet, let candidates upload from cloud storage, such as Dropbox or Google Drive. You’ve seen them all: office staff jumping in air, woman wearing telephone headset, suited men shaking hands, hardhats and London skylines. You switch off and skip over them …a little bit more trust in the brand is eroded. 4. More about you than them. “X and Y saw a gap in market to do Z, because we recognised our unique ability to…” Subtext: aren’t we great? See above. Your agency covers my niche well but there’s nothing that takes my fancy right now. I don’t want to call you and waste both our times. Can you push out job alerts to me so I can keep an eye on what you have coming up? You seriously expect me to hang around for the FOUR WHOLE SECONDS it takes to load properly? 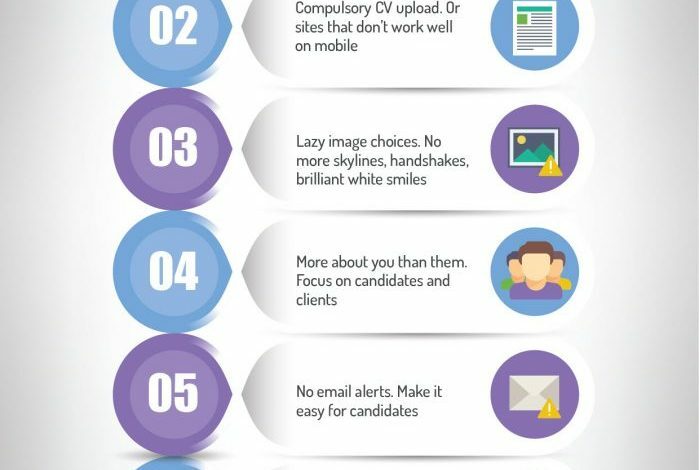 On the web,first impressions are formed in the blink of an eyelid (and we know you do the same with candidates). The numbers don’t lie: the longer your site takes to load, the more people lose interest.